EasyRPG is a community project to create a free, open source, role playing game creation tool, compatible with RPG Maker 2000/2003 games. Play RPG Maker 2000 and 2003 games on GNU/Linux, OS X, Windows, Nintendo 3DS, Wii, mobile devices and more with EasyRPG Player! You can even play games in your browser! 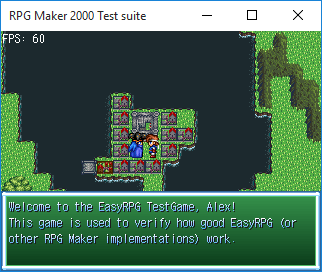 EasyRPG Editor wants to import RPG Maker 2000 and 2003 games easily! The Tools can work with original data files. Contribute programming, making resources, reporting bugs, creating a sample game or translating!